For some reason several of my Clethra shrubs did not produce flowers this season (they're approx 3 years old). Can you think of a reason why this would be? Otherwise, they seem to be quite healthy (plenty of greenery). Should I try fertilizer? If so, when? Also, since they are about 3 years old, they are in need of pruning. Can you advise me as to when and how to prune them? it would be interesting to know whether your shrubs did flower well in the previous seasons? The growing conditions are not correct. 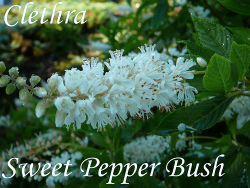 Clethra shrubs like sun to part shade and a moist, acidic soil. If your plants are too shaded they won't flower well. They should have at least half a day of sun. Maybe the trees behind them grew too big in the meantime and are shading them too much? The ground could be too rich. If you use a lot of fertilizer with too much nitrogen it encourages a lot of lush growth but no flowers. The plants go very leafy. The ground is too dry. The plants are not mature or established enough yet to produce flowers. If your Sweet Pepper Bush gets too much shade you could try to cut back overhanging trees to give them a bit more light. Alternatively you could transplant them to a sunnier spot. You could also try a fertilizer that is low in nitrogen but high in potash. Potash encourages flowering and fruiting. Tomato fertilizers are usually high in potash. Apply the fertilizer during spring. If your soil tends to dry out try a layer of mulch around the plants to keep the moisture in the ground. You can prune your Sweet Pepper Bushes in late winter or early spring. Remove damaged branches first, right at the base. Then remove old and woody branches. Cut back about one third of the old growth to encourage new shoots. Hope this helps! Send us a picture when they flower!